After many years of hard work and studies, you have finally reached the point where you are a graduate and now need a pulmonology fellowship or interventional pulmonology fellowship to further your knowledge accordingly. Applying for such medical fellowships is far from easy and you could face failing to get a place due to not having been aware of all the requirements or not being a talented writer. We wish to support you toward this end with our most competent and talented writers to achieve your goals. After having placed your order, you will be contacted by our experienced writer who is a qualified and knowledgeable expert. He will collect all relevant data from you before setting out to create your fellowship personal statement for an interventional pulmonology fellowship, ophthalmology fellowship personal statement or any other program you need. It will capture the reader from the beginning until the end while being written error-free. Explaining why you chose this area of specialty and what your goals are after the pulmonology fellowship has been completed is included. What goals you want to reach within five and ten years and what your life’s goals are in medicine. This will greatly increase your chances of receiving an invitation for an interview with the admission committee. Phrase clear and concise – use simple words to phrase your text to the point. Do not use too many adverbs and adjectives. Do not forget that the content and the presentation are of equal importance. A first draft is never the final version, and five or six more versions might be necessary. “Living in the forest that grows on the mountains of Colorado serves the purpose of living a laid-back and tranquil lifestyle. This solitude was abruptly interrupted when my little sister developed asthma and was lying on the ground writhing for air while coughing her little lungs out. There was no doctor around for many hours and we had to use a dish of steaming water for her to inhale the vapors mixed with menthol. When asthma reduced its symptoms we drove directly to the next doctor who was able to offer medicine and an inhaler for immediate use but referred us to a pulmonologist for further treatment.At the doctors clinic in Denver I received my first insight into lung related medical topics and I was surprised how it interested me. The same day I convinced my mother to buy some books on the topic so we could be better prepared to help my sister. I read all 3 books front to back within 3 days and was surprised that I felt I still needed to know much more. When you place your order with us, you will be entitled to an unlimited number of revisions. We offer a complete satisfaction or money back guarantee. 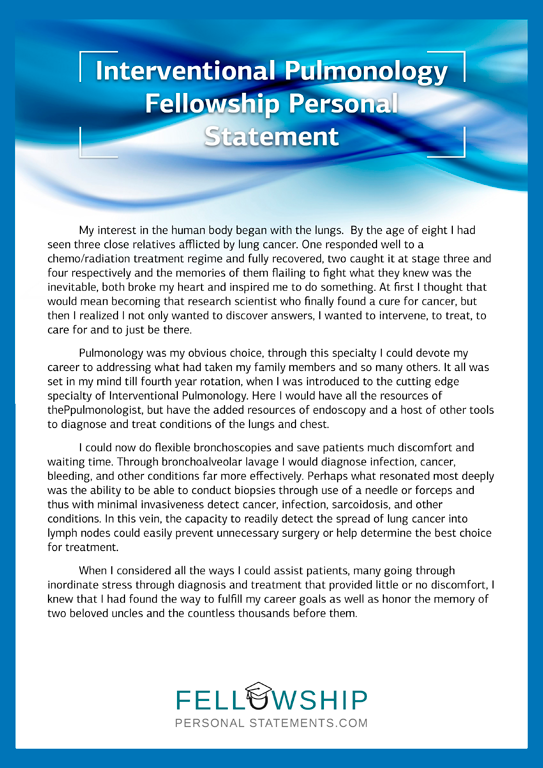 Make sure your interventional pulmonology fellowship personal statement or your diabetology fellowship personal statement will be completely flawless! Contact us for ophthalmology fellowship statement on our 24/7 website today and place your order!